Remembered as a technical surgeon par excellence, a teacher, and role model, Robert B. Wallace, M.D. was born in Washington, DC, in 1931 and grew up during the depression and World War II. During his second year of high school, he received a scholarship to attend St Peter’s School in Peekskill, New York where he distinguished himself as an outstanding football and baseball player. When he he graduated from St. Peters, he was offered a professional minor league baseball contract by Clark Griffith, owner of the N.Y. Giants. Dr. Wallace told him that he had an opportunity to go to Columbia College on a full scholarship. “I think that’s a good idea,” was the owner’s reply that ended Dr. Wallace’s baseball career. At Columbia he played football under legendary coach Lou Little, whom became one of his most influential mentors. It was with the encouragement of Coach Little and others that he applied to Columbia University College of Physicians and Surgeons and was accepted. During his medical school years, when Dr. Wallace reported to the Coach Little that he was financially strapped, the coach told him, “You may not get through medical school, but it won’t be because of finances,” and made sure that he had more jobs than he perhaps wanted. Dr. Wallace’s plan to pursue a career in internal medicine changed during his fourth year of medical school when two chief residents Keith Reemsma and James Malm convinced him to become a surgeon. He began his residency at St. Vincent’s Hospital in New York but moved to Methodist Hospital in Houston where he trained under Drs. Stanley Crawford and Denton Cooley from 1962 to 1963. There, he was also strongly influenced by Dr. Michael DeBakey, who he considered the hardest working person he had ever known. Leaving Houston, Dr. Wallace didn’t return to New York as planned, but accepted a cardiac surgery fellowship at the Mayo Clinic in Rochester, MN, under Dr. John Kirklin. It turned out to be the most productive educational year that he had. “Working primarily with Dr. Kirklin, Dr. Wallace recalls being exposed to a breath of physiology and pathology as never before. After completion of his fellowship, he was asked to join the faculty of the Mayo Clinic where, over the years, he made significant contributions in the fields of both congenital and acquired cardiovascular diseases. There he performed the first Rastelli operation for transposition of the great vessels on July 26, 1968. Wallace recounts this time as one of the exciting developments in cardiac surgery and his most productive period academically. 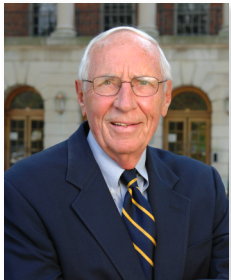 When an opportunity for new challenges to create a strong university-based cardiac program arose at Georgetown University Medical School, Dr. Wallace returned to his hometown for his final 17 years of working before retirement. Dr. Wallace’s career reflects the importance of mentorship as well as being a role model for surgical trainees. He is remembered as having a strong sense of propriety but being humble and down to earth. He was a fair, but demanding, leader who ran a tight ship and trained many of the top cardiothoracic surgeons today.